The information in this publication is based on NIOSH supported research; Nail Gun Safety: A Guide for Construction Contractors (NIOSH Publication No. 2011–202/OSHA Publication No. 3459–8–11); and focus group discussions with residential building subcontractors, safety specialists and workers. 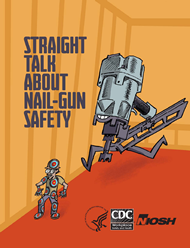 New nail gun users must receive safety training, not just a copy of this publication. Safety training requirements are described in detail in Nail Gun Safety: A Guide for Construction Contractors and can be viewed and printed or downloaded from www.cdc.gov/niosh/docs/2011-202/. Bring up your print screen. Go to the page handling feature. For example, your print screen may read “Page Sizing & Handling” or “Page Handling”. Adjust the printer settings so that each page aligns from the top to bottom and reads left to right. On some printers the setting is “Print on both sides: flip up”.